Even a novice baker can make tender, flaky from-scratch biscuits. Go get some flour, baking powder and cream cheese, and we'll show you how. Mix flour and baking powder in large bowl. Cut in cream cheese with 2 knives or pastry blender until mixture resembles coarse crumbs. Stir in shredded cheese. Add milk; stir until mixture forms soft dough. Pat dough to 3/4-inch thickness on floured surface. Cut into 14 rounds with 2-inch fluted cookie cutter, rerolling scraps as necessary. Place, 2 inches apart, on baking sheet. 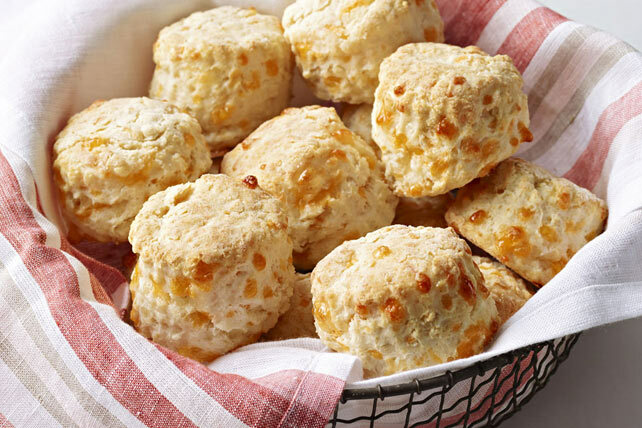 Use only regular cream cheese since the light variety will produce lumpy biscuits. Pour in milk all at once and mix briefly - don't worry if small pieces of cream cheese remain.